If you’ve been considering an outdoor renovation project for your home, you’re not alone. Outdoor renovation projects have shown steady increases across Canada in recent years. In fact, a new poll from CIBC shows that Canadian homeowners have shifted their budgets from indoor upgrades to popular outdoor renos—42% in 2016 compared to 25% in 2015. Homeowners have begun to understand the emotional and lifestyle benefits of spending time at home. In addition to creating increased curb appeal, purchasers find homes with outdoor living spaces are more attractive and provide greater value. 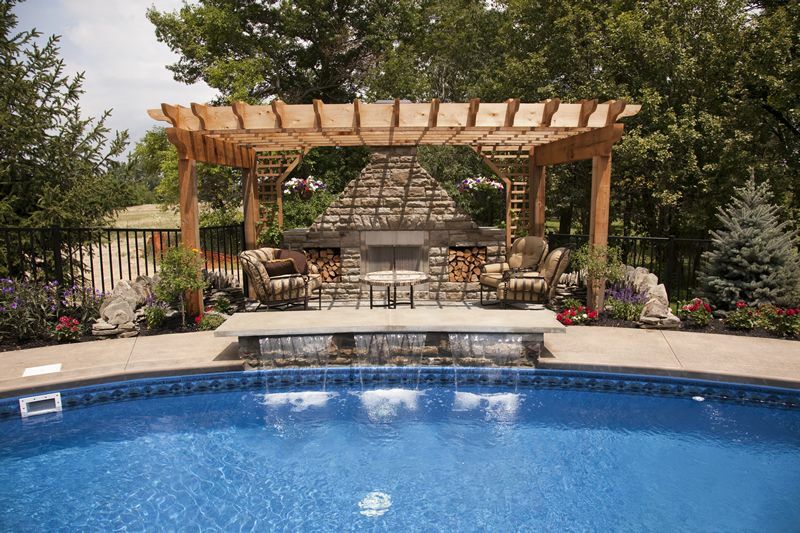 Patios and outdoor renos can generate as much as a 60% ROI when selling the home. Well-built patios, while a significant investment of time and money, are low maintenance and can hold their value for more than 25 years. They are impermeable to rot, mold, pests, and natural elements plus look great year after year. New designs are being used that turn flat, concrete surfaces into multi-level patios with built-in seating and retaining walls. Their solid base also makes them ideal for heavier elements like hot tubs, fireplaces, and outdoor kitchens. Concrete – This inexpensive option doesn’t have to be boring anymore. Stamped concrete mixed with a colouring agent can provide an attractive, yet natural appearance. This may need reapplication every few years to keep it looking its best. For a lower maintenance option, consider trowel designs in standard concrete, adding exposed aggregate or glass pieces. They will give your patio a unique design with minimal care required. Natural Stone – For an elegant, yet natural look, there are no better choices than natural quarried stone. Select from flagstone, slate, limestone and bluestone to create a one-of-a-kind design. Each piece will vary in shape and thickness, so installation will take longer, but the finished product will be worth the wait. Brick – If you’re searching for an Old World look, bricks will be the perfect choice for your new backyard patio. They come in a variety of colours and textures to enhance your outdoor space. Be cautious if it’s used in an unprotected area as freezing temperatures can lead to cracking. Moss may also be a concern and must be cleaned off regularly to prevent a slipping hazard. Pavers – This product has become widely accepted as the material of choice for patios. Manufactured paver stones come in a variety of shapes, patterns and colours, and their uniform thickness makes for a simple installation project. Rounded and edge pieces make circular or curving patios even more popular. Artificial (Faux) Stone – As the name suggests, these “stones” are made from plastic resin. They’re lightweight and can withstand even the harshest of Canadian winters. They can be used with interlocking pavers or used individually. Their colour schemes generally imitate natural stone products such as brick, sand, slate, stone and granite. Interlock Tiles – Made from wood plastic composite, these use an interlocking design to create durable and fashionable patios. They come in 12″ x 12″ tiles, so installation time is reduced from other products. This theme not only relates to extending your home’s interior design features to your patio, but also to adding convenience and comfort to the outdoor space as well. 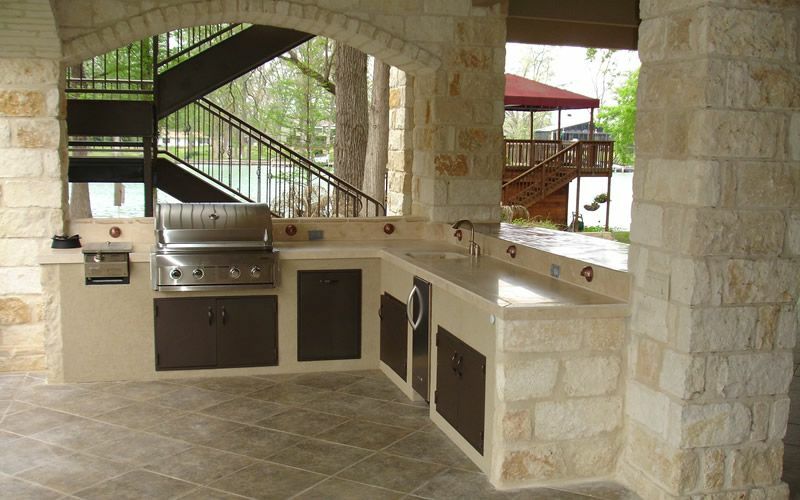 Outdoor kitchen or grill station – The sky’s the limit on how simple or elaborate you’d like your cooking area to be. If you’re handy, you might want to incorporate a propane gas grill, plus a table and chairs for a practical cooking space. If you’d like something more elegant, consider hiring a professional patio contractor like KP Construction to design a complete kitchen with built-in appliances, cabinets, lighting, and seating. Choosing the location for your outdoor kitchen will take some planning. Make sure exhaust from the grill or stove stays outdoors so watch for wind patterns before making your kitchen permanent. Consider accessibility for your indoor kitchen as you’ll likely walk bath and forth during entertaining. 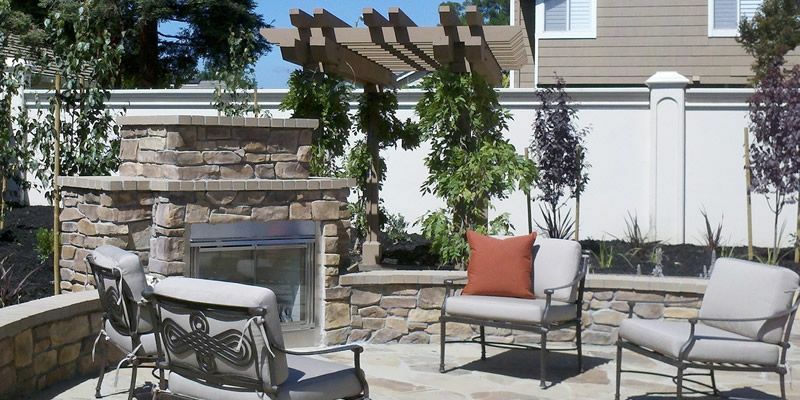 Stone fireplace – Just as the fireplace is the focal point inside your home, so too, will your outdoor fireplace be. You can add textural interest with stucco or brick or include natural stone to match or contrast your home’s side and patio floor. Add artwork, decorative grates, and weather-resistant outdoor furniture to complete the look. Pergola or gazebo – Consider adding a shaded area with a pergola or gazebo. Incorporate comfortable seating, some vertical landscape elements or some mosquito netting to keep pesky insects from disturbing your quiet time. Fire pit – These can be anything from a free-standing style to a built-in permanent structure. They’ve become a very popular addition to many backyard retreats as a perfect place to entertain friends and family. Think about creating a separate patio away from the main entertainment space so smoke doesn’t interfere with other activities. Hot tub – There’s nothing better to relax those tired muscles after a long day at the office than a few minutes in the backyard hot tub. There is a selection of sizes, styles, and options to choose from. Some even include a television so you won’t miss one minute of the game. Water features – No yard is complete without a cascading waterfall or decorative Koi pond. Add a garden bench or a wide retaining wall for visitors to sit and visit or relax in this peaceful environment. Arbor swing – Place a swing along a garden path away from the main patio area to create a private retreat for reading or meditating. Outdoor lighting – Lighting accents will provide security along walkways, staircases, and grilling areas. Kitchen and eating areas will help extend your time outside when the autumn days start getting shorter. Arch or trellis – Help define separate activity areas by adding an arch or trellis. Add interest with some colourful climbing plants. Fencing – Whether it’s light and airy like latticework, decorative like bamboo, or environmentally friendly recycled barn wood, creating a chic boundary for your outdoor patio area will add to its appeal. Decorative accents – Don’t forget to include some colourful throw rugs, pillows, artwork, and themed pieces to brighten your backyard patio. KP Construction proudly provides expert patio design and construction services to the residents of Markham, Toronto and GTA. Contact our professional team to schedule your free, no-obligation consultation today. We provide high-quality, professional services to help you create the outdoor living space you’ve always dreamed about. Our team members are experienced and licensed to provide peace of mind from start to finish.